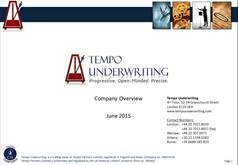 Marco is a founder and the original architect of Tempo Underwriting. Marco has spent the majority of his career growing, transforming, restructuring and driving innovation in financial services businesses. Prior to Tempo, Marco founded JRP Underwriting, an insurance underwriting agency which specialises in UK and Irish commercial property risks. Prior to JRP, Marco headed corporate development at Carroll & Partners and was an independent strategic advisor to many leading financial services companies including Royal & Sun Alliance, RBS, BACS, VocaLink and Kensington Mortgages. Marco’s early career was spent with Ernst & Young, Accenture, American Express and Digitas (formerly Modem Media). Marco holds an MBA from INSEAD and a Bachelor of Commerce degree from Queen’s University in Kingston, Canada. Marco speaks English and French and lives in Dulwich with his wife and two children.